This Company is Uniquely Positioned for an Upturn in Uranium | Energy and Gold Ltd.
Kivalliq Energy (KIV.V), a Canadian junior uranium explorer, recently released drill results from its flagship Angilak project in Nunavut, Canada. The results were promising to say the least, with all nine drill holes returning highly anomalous levels of uranium; including three holes that can clearly be viewed as high/ore grade material. While many other uranium explorers have mothballed mines and drastically reduced exploration activity, Kivalliq has continued to execute on its plan of exploring and expanding its growing portfolio of Canadian uranium resources. 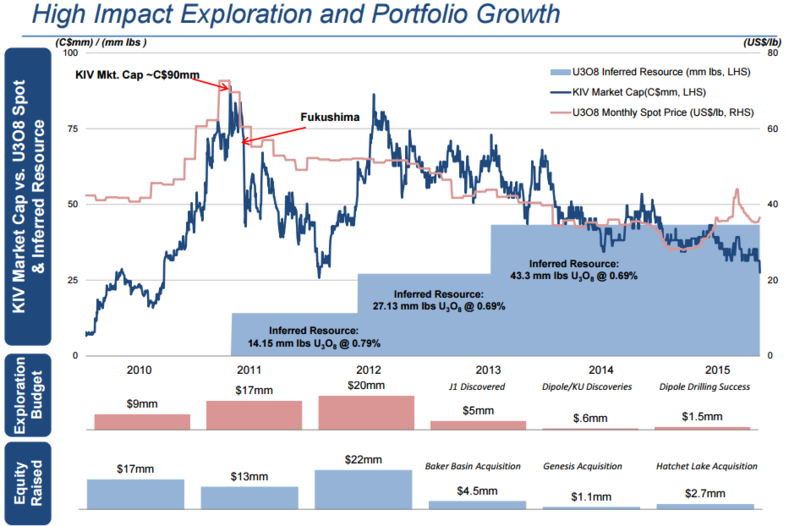 Instead of viewing the post-Fukushima downturn in the uranium sector as a problem, Kivalliq has seen it as an opportunity to acquire high quality uranium assets at bargain basement prices. In the last four years since Fukushima, Kivalliq has grown its flagship Angilak resource from 14 million pounds to 43 million pounds. In addition, Kivalliq diversified its resource portfolio by acquiring two properties just to the east of the Athabasca Basin (Hatchet Lake and Genesis). Meanwhile, Kivalliq’s equity valuation has dropped from nearly C$100 million to roughly C$20 million as investors have panicked out of the space. Kivalliq is arguably one of the best managed uranium explorers out there, one only needs to look at the results this management team has produced in a very challenging environment over the last few years. Look for the company to release soil sample results from what the company believes to be a mirror trend adjacent to the Dipole-RIB target from which Kivalliq released 9 drill hole results last week. The objective is to further confirm that a mirror trend exists and the Angilak Project is a substantial & robust mining camp. The EnergyandGold.com employees are not Registered as an Investment Advisor in any jurisdiction whatsoever. EnergyandGold.com employees are not analysts and in no way making any projections or target prices. Neither the information presented nor any statement or expression of opinion, or any other matter herein, directly or indirectly constitutes a representation by the publisher nor a solicitation of the purchase or sale of any securities. The information contained herein is based on sources which we believe to be reliable but is not guaranteed by us as being accurate and does not purport to be a complete statement or summary of the available data. The owner, publisher, editor and their associates are not responsible for errors and omissions. They may from time to time have a position in the securities mentioned herein and may increase or decrease. Please always do your own research. Still, the owner, publisher, editor and their associates are not responsible for errors and omissions concerning this data. Important This document is distributed free of charge, and may in no circumstances be sold, reproduced, retransmitted or distributed, without written consent from EnergyandGold.com.